TGIF! I am totally throwing it back to my retail days in college where they played this song non-stop but seriously Friday, I’m in love with you. It’s Friday I’m in love. Today I am sharing a tasty Harvest Cider Mule cocktail AND I have a giveaway to a FUN 5K happening in December (giveaway is closed). Fridays were made for happy hour and boy do I have a delicious fall happy hour drink for you today! 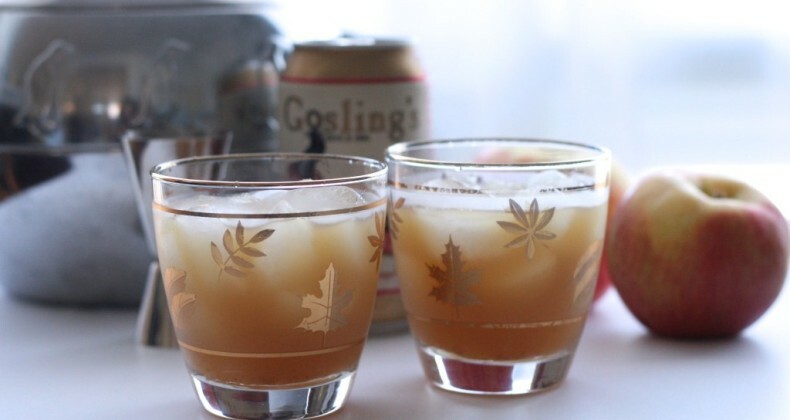 This is my fall riff on the infamous Moscow Mule. Vodka, lime, and ginger beer are so refreshing during the blazing hot summer months but I needed something a tad cozier for the fall. Apple and ginger work so well together so I thought why not apple cider + ginger beer. Well lemme tell you, it worked! I have made a vodka version and a spiced rum version. For science you know. And both were uber tasty. Do you prefer a vodka drink? A cider drink? Well, you can have it both ways. After you throw back a few of these mules you can’t blame me if you start singing songs that remind you of the good times. Last month I hosted a Thanksgiving dinner with my friends and I really wanted a signature Thanksgiving cocktail to serve. So I needed to test my idea with various alcohols. When I was testing this recipe I shared this shot on Instagram and said I was testing cocktails. I followed it up by saying the cocktail was just rum and vodka mixed. 🙂 Some days the temptation for a drink like that might be there. 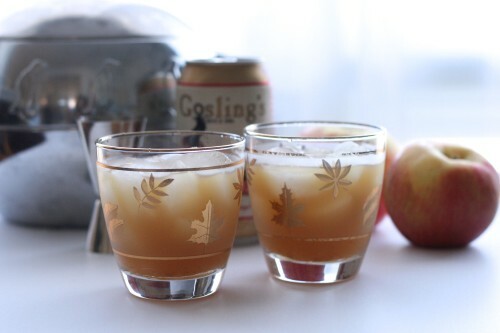 The formula for this Harvest Cider Mule is really easy. 3-2-1 This way you can easily scale it up for a party. Apple cider (3), ginger beer (2), and vodka or rum (1). Truth be told I probably did more like 1.5 on the vodka. So you could do it in ounces, cups, or gallons whichever you prefer. Serve this at all your fall gatherings. Thanksgiving included! Cheers! It was a fun twist on a favorite cocktail! I am going to try that cocktail! Very festive! I hope you enjoy it Leah! missed it 🙁 This sounds like so much fun!!! Hoping to get to do it this year. Ohh this drink sounds fabulous! Thanks Erin! It is perfect for entertaining. 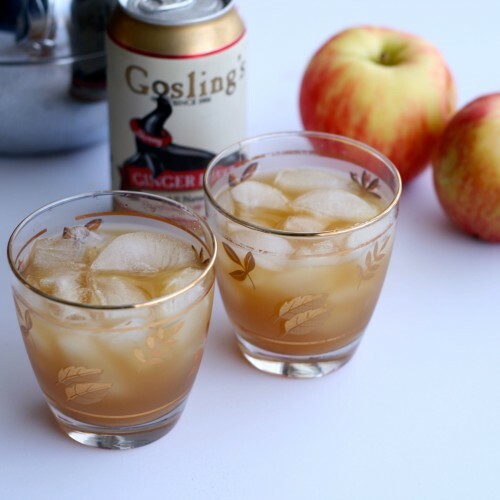 I love, love, love apple cider and this drink sounds delicious! I’m bookmarking this for the upcoming festivities, it would be just perfect! I love the recipe for this libation and the glasses that contain it! we love goslings ginger beer. I am sure anything mixed with it would be a hit. I think it is my favorite ginger beer! This cocktail sounds great! And I love that song too – brings back memories. I love how easy this drink is! Thanks Debi! Isn’t funny how some songs just pop into your head. 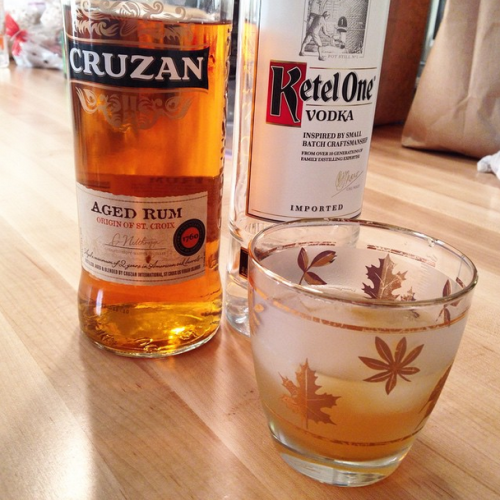 As it gets colder out I favor the rum version.